We stare down our closets five days a week in search of the perfect professional-meets-fashionable ensembles, and by the time Saturday rolls around, a lady can be forgiven for not wanting to give an ounce of effort to her outfit. But here’s the thing about being a fashion girl—you can’t just turn off the impulse to look stylish, even if you wanted to! As such, we went ahead and culled the best lazy-girl looks that are easy to copy, comfortable to boot (no heels allowed), and, most importantly, sartorially satisfying. Click through now to get your weekend look on lock. Style lesson learned: Ladylike pieces, such as a camel coat and a leopard bag, look incredible balanced against edgier items like heavily distressed jeans and geometric print creepers. 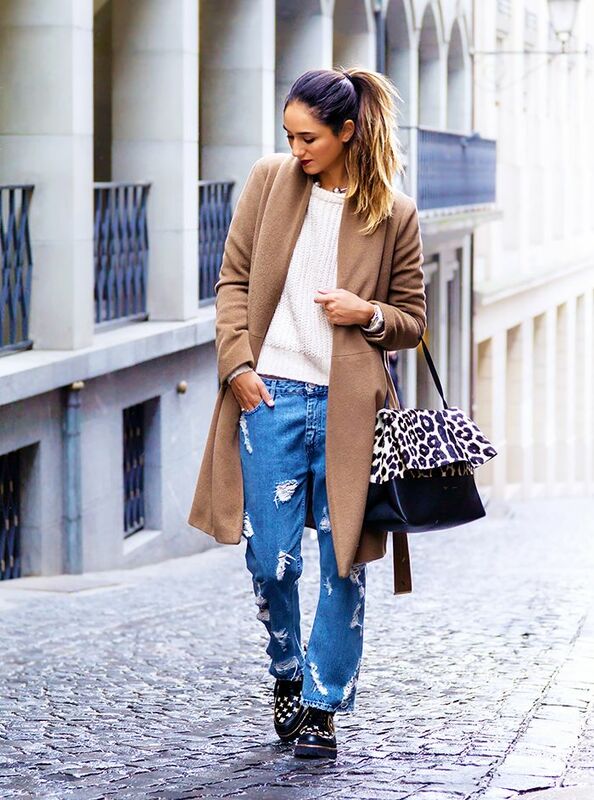 On Soraya Bakhtiar: Gerad Darel coat; Acne sweater and jeans; Marni shoes; Céline bag. If you can justify the splurge, a cashmere coat is the ultimate investment piece. Take your denim distressing to the next level with these statement jeans. This bag has versatility in spades. Carry it by the handles for a professional look and wear it cross-body on the weekends. A double-denim look is perfect for your off-duty outfit, plus slip-on sneakers offer a stylish way to run errands in comfort. On Jessica Stein of Tuula Vintage: ​Madewell Perfect Chambray Ex-Boyfriend Shirt ($70) in Ferrous Wash; ASOS Denim Ripped Pelmet Skirt ($53); Windsor Smith Slide Sneakers ($102); Chanel bag. If you don’t have a faded chambray shirt in your arsenal at this point, please use this article as your excuse to go get one. We like to add extra distressing to our ripped denim for a customized look. Leopard print adds a feminine spin to a borrowed-from-the-boys sneaker. And just like that, we need a pink fedora. Not only does it add an unexpected dash of color, but it's also an easy way to make an outfit feel thought-out. On Andy Torres of Style Scrapbook: Mango jacket; Uniqlo sweater, M.i.h The Phoebe Jeans ($265) in Original; Marc by Marc Jacobs bag; Maison Michel Virginie Fedora Hat ($462) available in Blue. Forgive us for tooting our own horn, but this hat is a dead-ringer for Torres’s. Quilted sleeves give this affordable biker jacket an authentic feel. Every woman should have a boyfriend jean in their closet. Wear them with flats on the weekend like Torres and then with a sleek pump for the office. Elevate your go-to sneakers with a pair of leather-like skinny pants and a tailored coat. On Blair Eadie of Atlantic-Pacific: Mason by Michelle Mason coat; Marc by Marc Jacobs jacket; Robert Rodriguez sweatshirt, Current/Elliott The Ankle Leather Skinny Pants ($985); Converse Chuck Taylor Low Sneakers ($45) in Black; Mansur Gavriel tote; Karen Walker Super Duper Strength Sunglasses ($280). Everyone has a classic black or camel coat, so why not stand out from the crown in vivid red? You don’t have a to pay a bundle to get the look of leather. There’s a reason Converse is such a staple in the sneaker world—their classic kicks are always in style. Oxford shoes are the easiest way to look pulled together without wearing a heeled shoe. On Zina Charkoplia of Fashion Vibe: Zara coat; & Other Stories sweater, pants, and sunglasses; Lottusse shoes; Givenchy Antigona Shopper Bag ($1058) available in Black. Pinstripes are an easy way to look polished, even when you feel anything but. Our bag of choice for the weekend is always a tote—it fits everything we need for a day on the go. Snakeskin adds a special touch to these smart oxford shoes. We can’t think of anything cozier than an oversized turtleneck and a pair of faux-leather track pants. Keep your outfit from looking sloppy by wearing a shoe that adds height, like Sariñana’s wedge sneakers. On Julie Sariñana of Sincerely Jules: Gap turtleneck; Rebecca Taylor Perforated Leather Track Pants ($1150); Isabel Marant Bekett Sneakers ($640) in Beige; MC by Alexander McQueen bag. Turtlenecks look cool, not contrived, when paired with edgy leather. Save your body-skimming leather pants for night, and opt for a stylish track pant for day. The multiple neutral tones make these sneakers easy to pair with almost anything. Overalls are the ultimate in comfort clothing. For a flattering effect, make sure your pair is fitted through the hips. Warning: People will want to pet you when you wear this oh-so-soft mohair sweater. Nobody knows overalls like Citizens of Humanity. Trust us: The fit is always spot-on. Balenciaga-inspired footwear at its best. Take note how this street style savant mixes style genres with ease. Her schoolgirl-meets-biker-babe outfit is a stroke of sartorial genius. Topshop is a godsend for affordable motorcycle jackets that still feel luxurious. An A-line skirt like this pleated number is flattering on almost every body type. Add a personalized touch to your white sneakers by getting the tongue embroidered with your initials. What's your go-to piece to wear on the weekends? Let us know in the comments below!